If you have been using our products you are probably very aware of the need for good soil aeration and reducing compaction. In the past we have talked about how clay soils can hold too much water and become soggy, swelled, and oxygen deficient. Now let’s talk about what happens when clay soils get too dry. A few weeks of mid-summer drought does not do much to harm soils, but when the drought goes on for a month or more, things can go really bad. In our area of the country, we’ve had a few months of virtually no rain. Soils have lost much of their moisture far beyond the root zone. As a result, the clay soils have deflated and actually shrunk back. Cracks are appearing in lawns and gardens and soil is pulling away from the foundation walls of many houses. In severe cases, the dryness has shifted enough soil to cause broken water mains that are deep under ground. 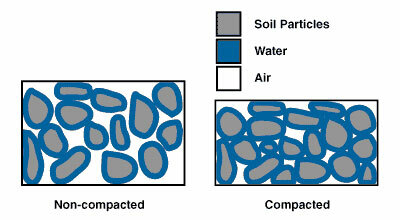 As far as the lawn and garden goes, the dry, shrunken soil has reduced pore (air) space in the root zone. In our area, yards that have not been watered regularly have lost much of the soil aeration that they had in the spring. The tightness around the roots now prevent both water and nutrient absorption. And because the soil has become more compacted, when water is finally applied it penetrates very slowly. The solution, of course, is to get more water into the soil in the lawns and garden beds. If the soil is rock hard the water will have a hard time penetrating, or could roll right off the high spots or inclines. The easiest way to get the water to move through the soil easily is to treat with Aerify PLUS before watering (or All-In-One for LAWNS if that is all you have). What we recommend is applying the product to the yard and then watering for a short time, perhaps 15 minutes. Then wait another 15 minutes for the water to penetrate a bit and form some channels the soil. After that, water heavily for at least an hour. If there is any sign of runoff, stop watering and give it time to penetrate. If you have any comments or questions about your lawn or any of our products, feel free to email us at info@natureslawn.com. We’re always happy to help!